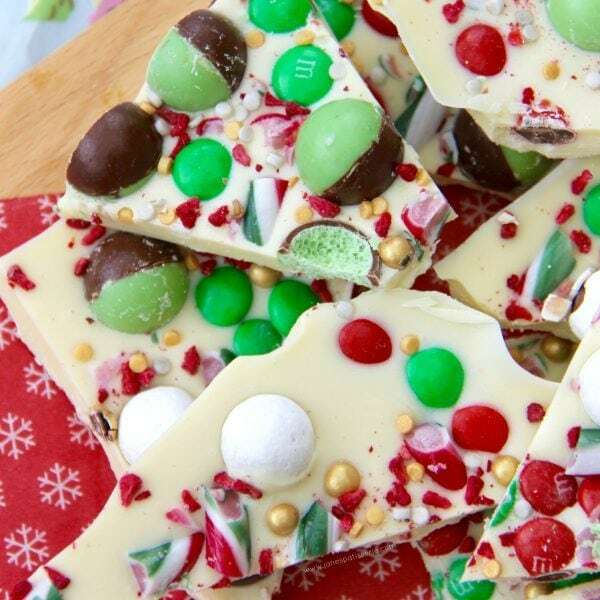 Delicious Christmas themed White Chocolate Bark full of all of your favourite sweets – perfect homemade gift idea! 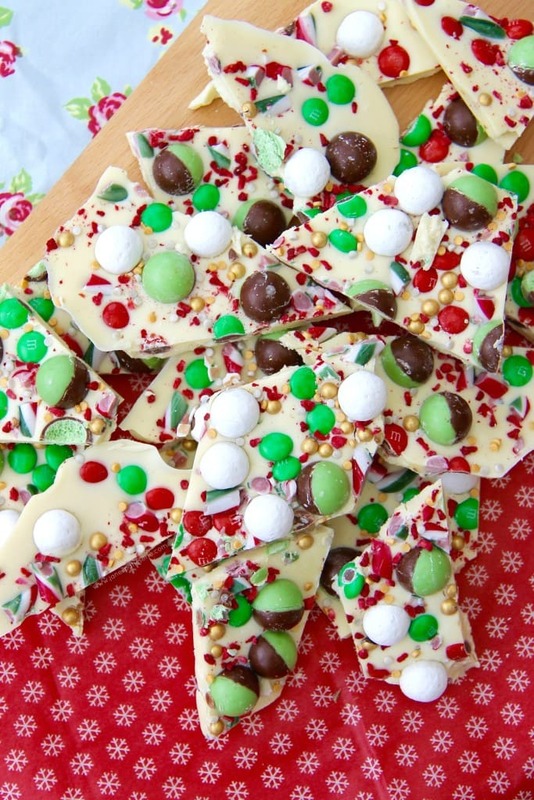 Ever since I posted my Chocolate Bark recipe a few months ago I have had so many lovely comments from those who have made it themselves, and especially those who had made it with their kids – it’s so cute to see everyone getting involved in baking my recipes! I decided back in Halloween to post a recipe for Halloween Bark, so it seemed silly not to do a Christmas one too! I decided to use my favourite Christmas sweets on this one – but its each to your own. 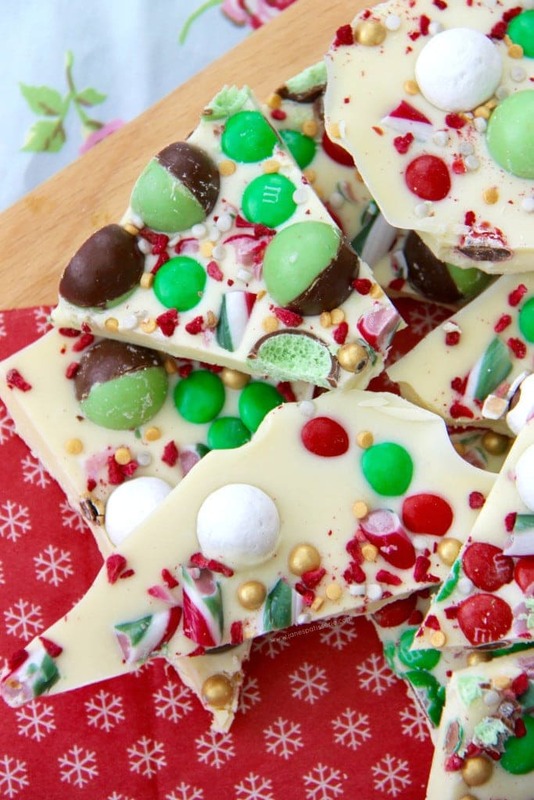 I LOVE White Chocolate, and Candy Canes so they simply had to feature – and yes, I did end up adding some Mint Aero which I was unsure of whether they would work together. However, the flavour of White Chocolate with the Mint was a dreeeeam! 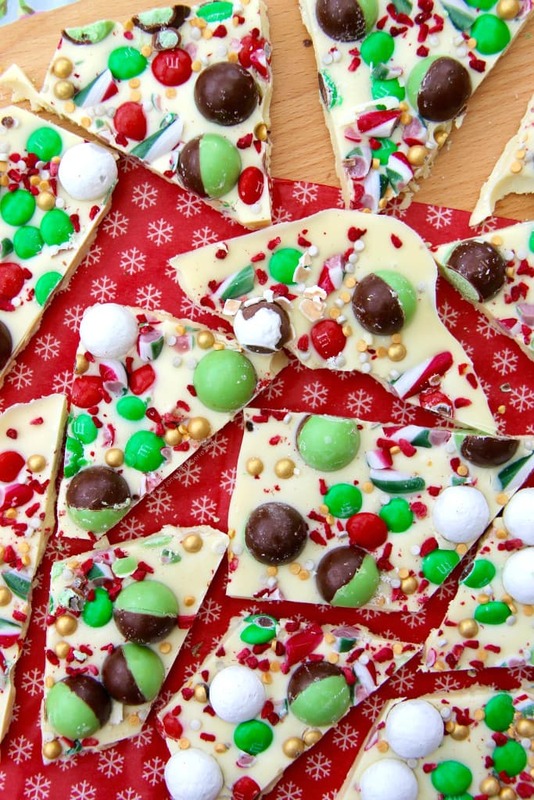 Chocolate Bark is one of those little sweet treats that are super fun to make with everyone, even make with friends, or make for little Home-Made Gifts for friends & family! I love making these as gifts around Christmas time in particular as Chocolate is usually a winner in most households, and especially in mine. Even though its very simple to make – its a nice little touch to show effort and fun! This year I packaged mine into little snowflake decorated bags for my gifts, and in some little chocolate boxes that you can buy online – I try to make it as personal as possible for each person who would want some – such as using their favourite sweet treats in the Chocolate Bark, and even using Dark/Milk/White Chocolate as the base depending on what they prefer but this is definitely my favourite personal flavour combination for Christmas time! 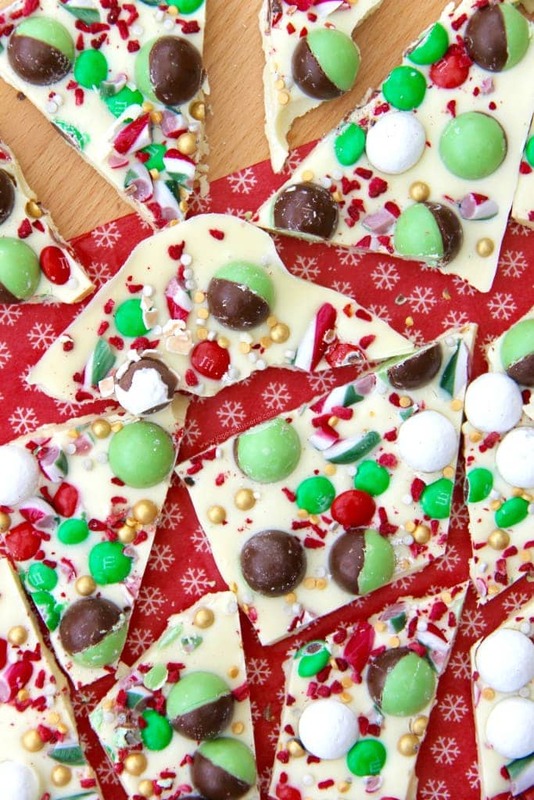 If you are looking for the Chocolate Orange Christmas Bark – Click Here! 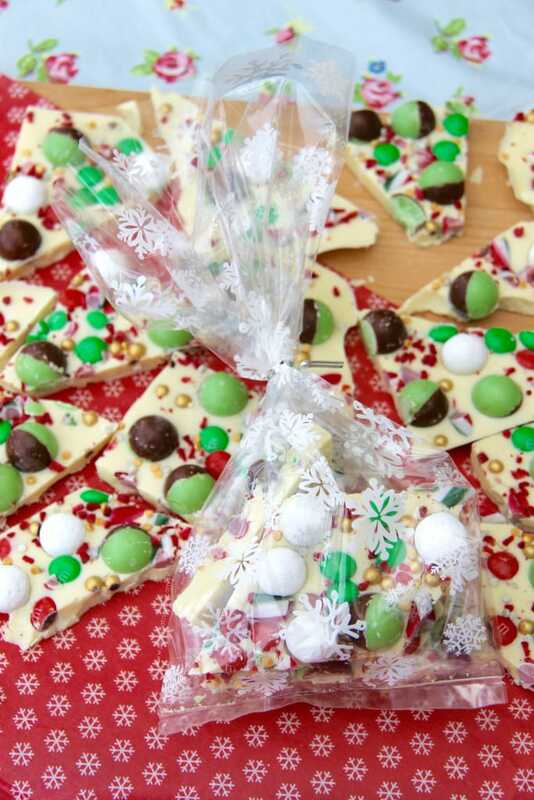 Delicious Christmas themed White Chocolate Bark full of all of your favourite sweets - perfect homemade gift idea! Prep what sweets/ Chocolates are going on your Bark – I chopped up my candy canes but left everything else as they were – be careful if using a knife to crush them though, don’t cut yourself! Melt the White Chocolate in a Heatproof Bowl over a pan of Simmering Water as there was quite a lot of it- you don’t want the water to touch the bowl however as it’ll ruin the chocolate! Pour the melted white chocolate into the tray and spread so its even – Sprinkle over your decorations and leave to set – if it's hot it might be best to do this in the fridge so it’ll actually become hard and its a lot quicker this way! Cut/Break into shards and enjoy! Older Next post: Red Velvet Cupcakes! Newer Previous post: No-Bake Honeycomb Crunchie Pie! Okay, I commented on your last festive bark (was it Halloween?) that I really needed to get round to making some – Christmas it is! I am making three recipes with candy cane and was wondering about the third! Looks like I’ve found it – this looks wicked!